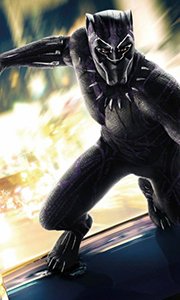 Own Black Panther DVD from Deff, DVD, Blu-Ray & 4K Video Specialists - Free UK Delivery..
Own Black Panther - Black Panther Vs Erik Killmonger Mug from Deff, DVD, Blu-Ray & 4K Video Specialists - Free UK Delivery..
Own Black Panther - City Mug from Deff, DVD, Blu-Ray & 4K Video Specialists - Free UK Delivery..
Own Black Panther - Claw Mug from Deff, DVD, Blu-Ray & 4K Video Specialists - Free UK Delivery..
Own Black Panther - Erik Killmonger Mug from Deff, DVD, Blu-Ray & 4K Video Specialists - Free UK Delivery..
Own Black Panther - King Of Wakanda Mug from Deff, DVD, Blu-Ray & 4K Video Specialists - Free UK Delivery..
Own Black Panther - Made In Wakanda Mug from Deff, DVD, Blu-Ray & 4K Video Specialists - Free UK Delivery..
Own Black Panther - Pounce Mug from Deff, DVD, Blu-Ray & 4K Video Specialists - Free UK Delivery..
Own Black Panther 3D Blu-Ray from Deff, DVD, Blu-Ray & 4K Video Specialists - Free UK Delivery..
After tragedy forces yound Prince T'Challa to assume Wakanda's throne, he is faced with the ultimate test, putting the fate of his country and the entire world at risk. Pitted against his own family, the new king must rally his allies and release the full power of Black Panther to defeat his foes and embrace his future as an Avenger. Special Features Play Movie With Director Ryan Coogler's Intro, Featurettes, From Page To Screen: A Rou..